A gratuitous picture of a frog because a cat would be too mainstream. I am going to step on toes today, including mine. I just know it. If you are angry with me after reading this, I apologize. Well, not really. Today we will deal with the person who can one-up you on anything. And if you think you don’t ever one-up people, you are incorrect. The more annoyed you get with someone who can top you, the more likely you are to be a one-upper. Let’s go through a few one-upping levels, shall we? Dead husband trumps dead cat. You must have a subject that is more valuable than the victim’s. Death trumps getting sick and then pulling through. To one-up for sympathy, you must have worse circumstances than the victim’s. It is not a good idea to name a cat Mittens. If you are going to gain one-upmanship through a pet story, either name it something like Abraham Lincoln for sympathy or Kanye West for congratulations. Okay, here are some types of one-uppers. Which ones are you? 1. Most poor: I hear much more poor-mouthing than bragging over wealth. Teachers do it all the time. Well, at least North Carolina teachers. Give me a break; we haven’t had a raise in over…..Oops. Did I just try to one-up you? At the end of each month, I hear friends brag on just how few groceries they have left. I have one saltine and an olive, says teacher A. Ooh! You have an olive? I’m on the last few crumbs at the bottom of the cracker sleeve, says teacher B. You have crumbs? I ask. 2. Most wonderful/horrible/difficult/amazing husband: Your husband had a heart attack? Hah! Her husband had a heart attack and drove the carpool kids to school before admitting himself to the hospital whilst giving himself CPR and eating a bacon sandwich. Using his own cell phone and a wad of used chewing gum he found on the floorboard, he managed to defibrillate his own heart, saving the family thousands of dollars on medical expenses and cell phone minutes. 3. Most amount of something that you would not think would be arenas of competition: Someone sneezed, and someone else said, God bless you. The one-upper began describing the amount and disgusting nature of snot she had blown out of her nose. I am not making this up, folks. 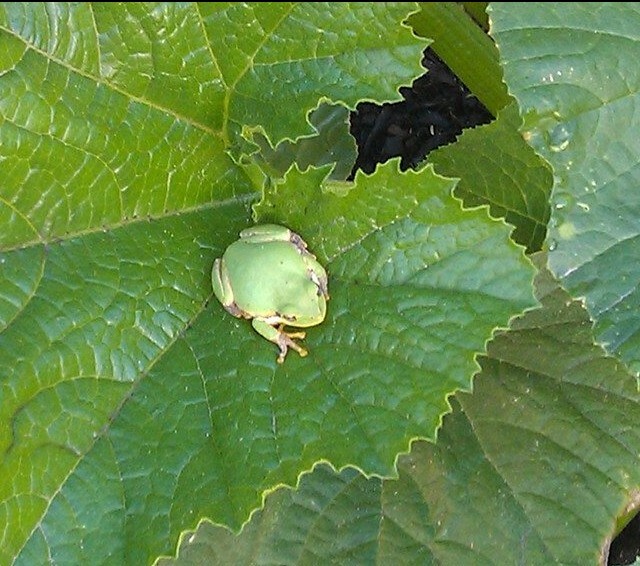 I made the grave mistake of talking about a cute little frog in my garden. I was beset with tales of how many frogs were in their gardens. It made the plagues of Egypt pale in comparison. I showed a picture of a pretty iris. He had way more irises than that; they stretched out for half a mile in every color God ever made. I made a comment about bluebirds nesting in a box; she had seen at least eighty-five bluebirds on her property, but, alas, they were all eaten by snakes. That was a double win for her – the obvious superiority of the bluebird-friendly environment of her yard plus the sympathy for the death of innocent birds. I realize how absolutely not fascinating this is, so I am cutting it short with a brief list. Feel free to leave other examples in the comments. Text message – Has to have the last text (LOL, ‘K, smiley face, etc.) I have begun to keep up text conversations with the guilty parties just to see how long they can endure. Injuries – Your back hurts? Her spine was ripped out when she fell, and she had to hold it on the way to the emergency room. Bad weather – It’s much hotter here in Iceland than where you live in the Namib desert. Bad luck – Too depressing to think about a bragging competition in this arena. Best book – After she gives a glowing recommendation of her book, her eyes glaze over as you suggest one. Cutest baby. FYI – all babies are ugly little bologna loaves. Perhaps, in part, we one-up for a good reason. We want to connect with the people we know, like, and respect. So if someone we like tells us a story, we want to say, Hey, me too! We have something in common. Perhaps the problem is that we just don’t know when to quit. If you have a spectacularly talented person who can top everything, consider it an honor to learn at the hands of a master and consider that perhaps she just wants to be your friend. Or not. Just know that there will be someone in your life who will top everything you and all of your acquaintances will ever do or say. If you don’t know anyone like that, may I delicately suggest that you might need to do some inner reflection? So, what type of one-upper are you? Yes, you are. I am deliberately guilty of the text message, but I also find myself using amazing imagery and hyperbole to describe the horrible deeds of my wonderful spouse. With the exception of one other person, no one fears spiders or clowns more than I do. And I make better cookies than you. You are very kind, ma’am. Thank you, ma’am. Very kind. Well I have the most amazing friend who writes the most clever blogs all while while managing a small farm, knitting and cooking for others, teaching full time, and running marathons. I’m pretty much the luckiest girl around because she is my friend and treasure keeper. You can’t top that- not even with a foil hat or a can of whipped topping.